It's been a while since I've posted a recipe. Has starting this new year been a bit tiring for you too? I have all these things I want to do, I'm actually loving the cold weather and snow that we're getting here in the area and I kind of just want to hole up in a mountain cabin and work by the fire. Anyone else? 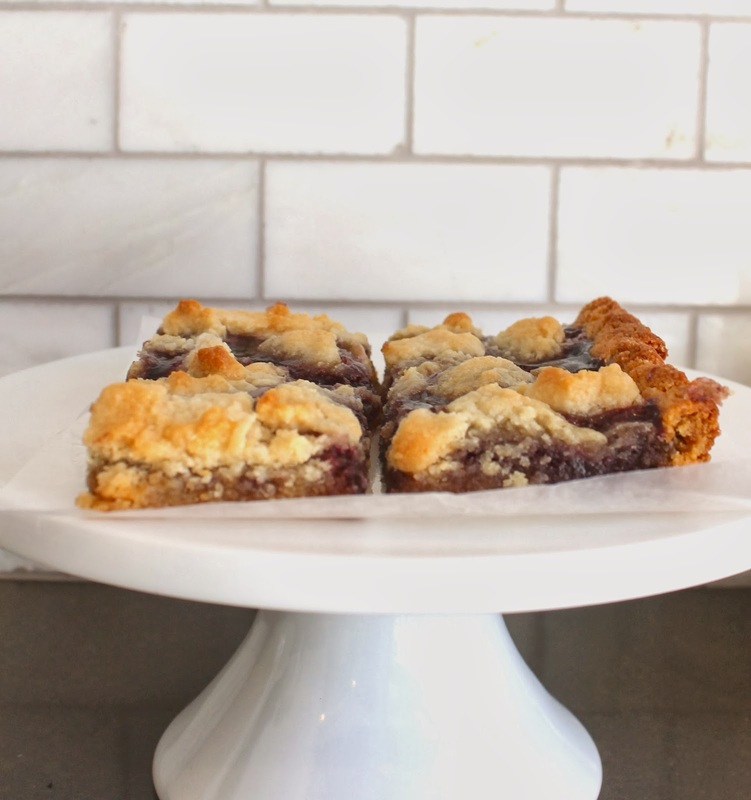 These cookie bars were inspired by This pie recipe from Blackbird Bakery and This cookie recipe from The Sensitive Pantry. 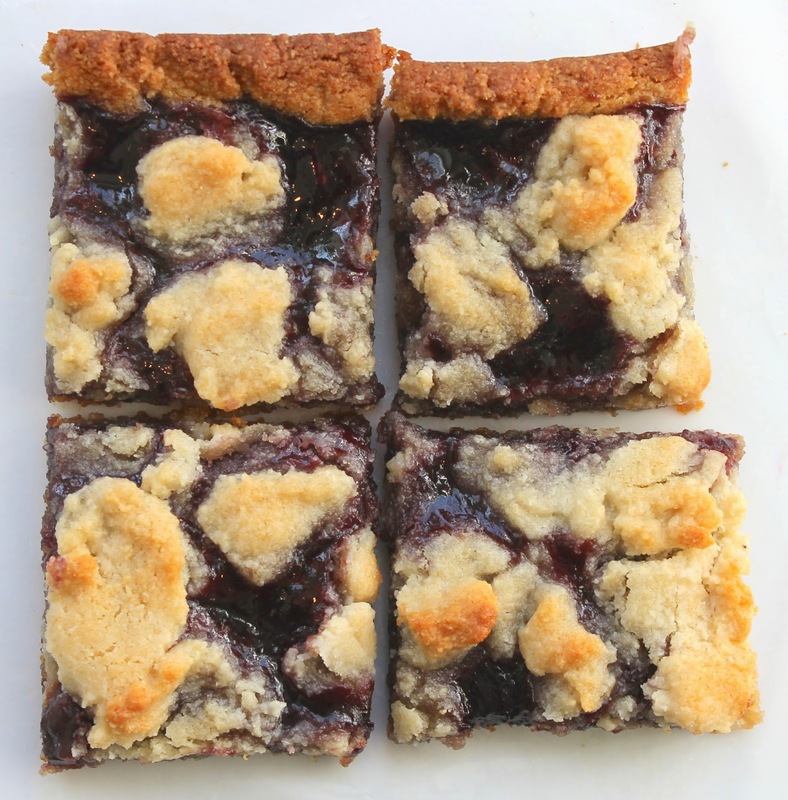 I love the crumble topping, the cooked jelly filling and the gooey cookie crust. And they're also really simple to make- as usual, nothing I make is really that hard. I had a really fabulous night hanging out with girlfriends last week and I made a version of these cookies. They went over well, and I've made a few changes that makes them even better! As usual, there are options to make it fit your needs or ingredients. For this recipe I used Seedless Blackberry Fruit Spread from Harris Teeter, and I've also used Trader Joe's brand Raspberry All Fruit Spread. The key for me was finding jellies with no added sugar or fake sugars. I made these using coconut oil, but you could substitute butter. And you could also add a layer of chocolate- I've included directions for that below. *To add a layer of chocolate, Remove the crust from the oven and top with the chocolate chips. Return to the oven for 3 minutes to heat the chips, then remove from the oven and spread evenly with a knife or offset spatula. Then follow the steps to add the all fruit spread and topping.